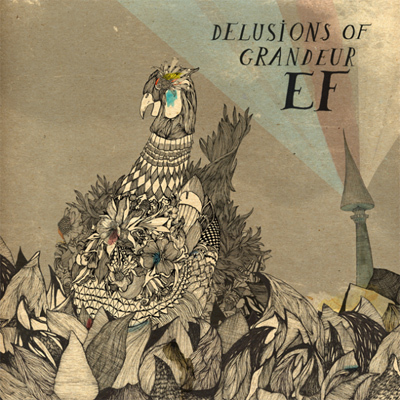 There is a blessed combination of heaviness and softness within the three parts of the 24 minutes long Delusions of Grandeur by Ef. As it happens, I find the music, and also the singing, to be as mellow and forgiving as humanely possible at times, bringing northern chill of fresh winter days to my dry spine. As these times pass, and music shifts, Ef turns heavy and massive. Not crushing, but much more intense and blunt. Still, Ef seems to know very well how to keep their gentle message through the rough storms they conjure as well as through the soft lullabies they make. The first song, bearing the name of this E.P, caught my attention the most with the perfect way in which Ef had orchestrated sadness through their music. The minimal, almost completely silent moments only set the ground to a massive guitars and drums. Remember the brilliant Sigur Ros video with the kids who play in the radioactive, now destroyed park? I think this song should have serve as the music to that beautiful production.